Gloucester-based Smiths Racing BMW have confirmed that they have signed 29-year-old Peter Hickman to contest the 2017 Isle of Man TT Races fuelled by Monster Energy and the other international road races. Hickman, from Louth in Lincolnshire, will also represent the team in the MCE BSB Series alongside Lee Jackson, riding the Smiths Racing BMW S1000RRs. 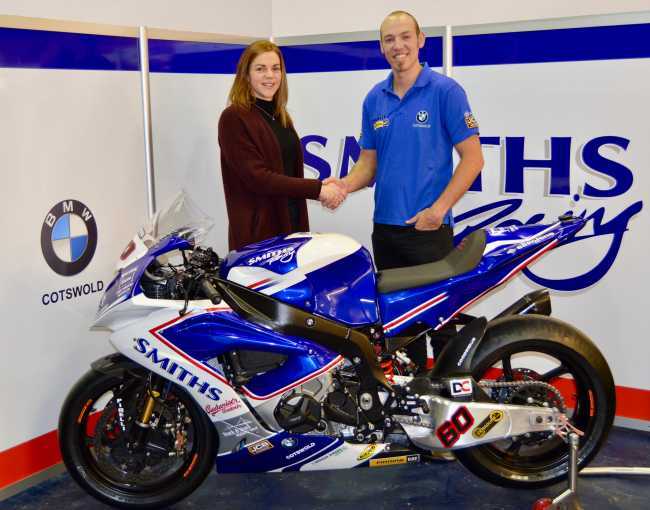 The former TT winners and double British Supersport champions endured a difficult season in 2016 due to a number of factors and over the winter months, Team Manager Rebecca Smith has considered their options carefully. Hickman made his TT debut in 2014 for the Ice Valley BMW team, taking a best finish of eighth in the RL360 Superstock race while he also won silver replicas for 11th place in the PokerStars Senior race and 14th in the RST Superbike. His results saw him win the prestigious Newcomers Trophy and his fastest lap of 129.104mph remains the fastest ever lap recorded by a Mountain Course newcomer. Continuing with BMW machinery in 2015, this time for Lee Hardy Racing, Hickman took fifth in the RL350 Superstock race, seventh in the PokerStars Senior and eighth in the RST Superbike Race to win three more silver replicas, improving his best lap to 131.626mph in the process. A switch to the GBMoto Kawasaki team in 2016 saw him take an excellent fourth place in the RST Superbike race where he lapped at 132.465mph to become the fourth fastest rider of all time. Hickman, from Louth, also won two MCE BSB races last season on his way to winning the Rider’s Cup title as well as taking victory at the Ulster Grand Prix and defending his Macau Grand Prix title. Very much in demand as one of the sport’s great all-rounders, Peter returns to the BMW marque with which he’s enjoyed so much success in the past. Tickets are now on sale and selling fast for the 2017 TT Races fuelled by Monster Energy. There is limited availability for the Glencrutchery Road Grandstand race day tickets apart from Senior Race day, which is already sold out. There are still TT Grandstand tickets available at Creg Ny Baa and the two Nobles Park grandstands during qualifying and race days. Grandstand tickets are also available by purchasing VIP or Platinum Hospitality tickets. All tickets are available from iomtt.com or by phoning 00 44 (0)1624 640000.